Roland Barthes (1915-1980), was probably the most important French thinker to emerge from the post-war period. He was part of every major intellectual movement in the humanities that came out of Metropolitan France between 1945 and 1980 and he became a figure of international repute. At a time of great social, political and intellectual change, Barthes represented an unconventional, yet often rigorous, way of thinking which had considerable appeal. This comprehensive study guide to Roland Barthes’s work tracks his intellectual evolution, with particular emphasis on those areas where his influence is felt most strongly today. 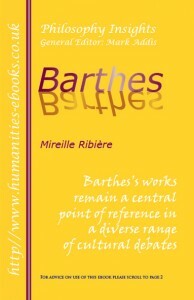 The strength and originality of Barthes’s seminal work are scrutinised in seven core chapters (Mythologies; Semiology; New criticism; Structuralism; Reader, writer and text; Pleasure, the body and the self; and Photography), and the successive shifts in his thinking are carefully explained. Another three chapters (Barthes in perspective; Barthes’s legacy; and Paradox: a way of thinking) offer an overview of Barthes’s career and assess his place in today’s intellectual landscape.